The underrated hacker is getting a new lease of life in the pro scene. Apex season three is in full swing, and, as usual, it’s been full of surprises and tactics that we haven’t seen much of in competitive Overwatch. One thing in particular has stood out that’s made me very happy: Sombra appears to be tip-toeing into the meta. She isn’t exactly a locked pick every time, but pros are starting to figure out how she can fit into their aggressive compositions on more than just one or two points on specific maps. 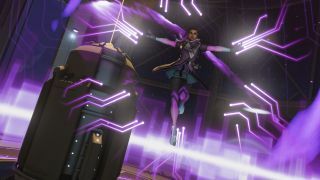 Given Overwatch’s reputation for welcoming creativity, Sombra’s rise was inevitable. What’s even better is that some of what we’re seeing is applicable to ladder play. Let’s take a look at what the hacker has been up to at Apex, and how you can emulate some of it on the ladder. As we’ve discussed so many times now, ultimate economy is one of the most important aspects of Overwatch that you’ll need to grasp. Do you need to use five ultimates in the upcoming fight, or will some combination of three get the job done? Well, because of how fast she builds her ultimate, EMP, some teams at Apex seem to let their Sombra players use it at will. It goes against conventional logic, but it’s effective. There was no need to piggyback Dragonblade off of EMP there, and, indeed, they build a Pulse Bomb during the harassment as well. His approach there shouldn’t be overlooked, though. Sneaky translocates have been the standard method of operation for dropping nasty EMPs on groups of enemies, and that’s something you can incorporate into your Sombra play with a little practice. As the tides of the meta ebb and flow for Overwatch, so too will the lengths its engagements. Tanks and healers have more or less reached a nice balancing point, so it’s doubtful we’ll see the action unfold at a snail’s pace anymore. Earlier this year things got pretty fast, but fights can be over in a matter of seconds now. More attempts at the objective mean more chances for success, plain and simple. Though the ladder meta hasn’t quite caught up yet, it’s getting there. That Sombra can shave time off of your team’s time in the fight shouldn’t be undervalued. All of her skills are debilitating in nature, and they all create unique opportunities for the burst-damage heroes that are so popular right now. Tanks are easier to take down, enemies can’t escape with ease and they can stay up longer without the need for a healer. These are all the things a character like Tracer depends on to be successful, so be a pal and give Sombra a chance. Now, don’t get me wrong. There is such a thing as “trying to force a hero”, as the casters say. This logic typically applies to niche hero picks that outlive their usefulness. Even though Sombra brings a lot to the table, you always need to take a breather every so often and assess your effectiveness. Her gun isn’t the easiest to kill people with, for example. Are you able to close the gap with frequency so that your ultimate is able to charge? Another thing to consider is your team’s willingness to play around you. Most players aren’t going to give you a very long leash to begin with, but if they’re not using your medkits or getting awful respawn staggers, it might be time to just pick someone else. Overwatch is still young, despite what some people might want to think. The esports scene is even younger by comparison. As pro, amateur and casual players continue to develop their understanding of the game, a strange hybrid character like Sombra will continue to be picked more and more without the associated groaning from the community. Now that the meta is in a state where flexibility seems to be conquering all, the future looks bright for the hacker that everyone loves to hate.